After I pieced the top I realized that I could have added another column and possibly a row to balance her out, but hey, I'm still learning. I love it and hope that the receiver will too. She is now on her way to OR via USPS. Yea! 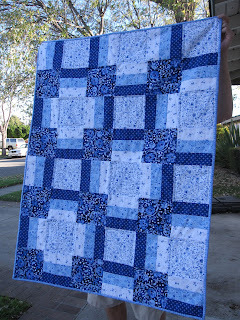 This morning I finished up the 40 blocks for the That Girl...That Quilt Quilt Along. I'm not completely caught up as now I have to make my blocks "wonky" but I do think I am halfway there as most of mine do appear to be wonky. A trip to Joann's tomorrow to get the right type of ruler and 25 yard of tulle. Tulle? 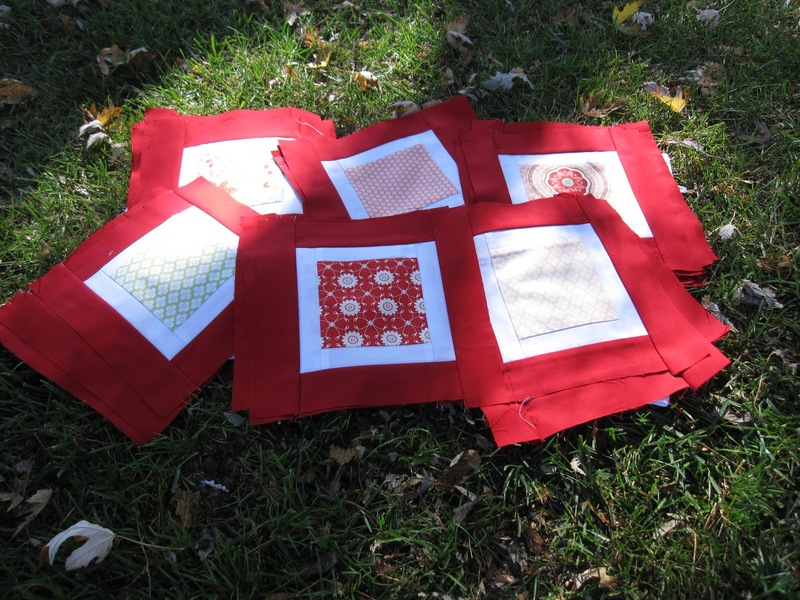 For quilting? Nope. It's for the gardening portion of this blog (the bougainvilleas part). 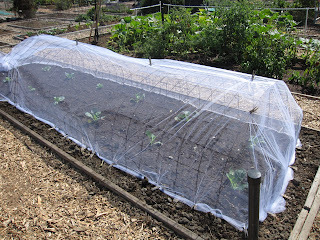 I have planted cabbage, cauliflower and broccoli at my garden plot and in order to come out at the end of the season with some wonderful vegetables, I have to cover them to keep the critters out. See exhibit A. If I can help myself this blog will be quiet for a few days while I focus on school. My final portfolio of all of my history work for the past four years is due and I need to tighten things up a bit. Kinda hard not to notice the Google Chrome button and then of course, I have to check Google Reader, Google Mail and then that leads to Facebook. Stop the madness! Love your blog. 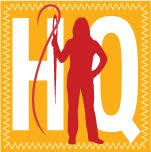 You are a busy gal with your boys, school, gardening, and quilting. Thank you for stopping by my blog. Did you know you are set to no reply? I cannot reply when you leave a message. Good luck with the win. That is a beautiful quilt, I love all those blues!! 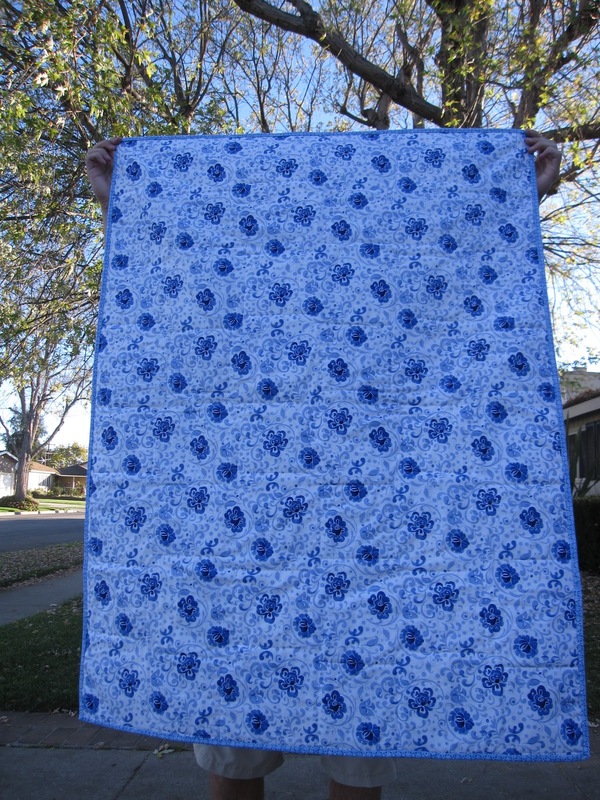 And your Quiltalong top is fabulous too!!! 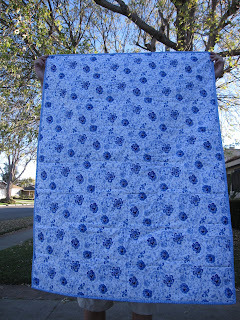 Thanks so much for linking up :) Oh and ps, I have a cute project in store for all that toile!